Ken Sivik of Bangor Hydro Electric Co. trims ice covered branches from power lines on Peakes Hill Road in Dedham on Thursday morning. After removing all of the limbs, the line will be energized, restoring power to the area that has been without since Monday. According to Mike Voisine with Bangor Hydro, crews have been working 16-hour days since Sunday. A fleet of bucket trucks lined up late Christmas night in Renys Plaza in Belfast, with the temperature dipping to close to zero degrees. 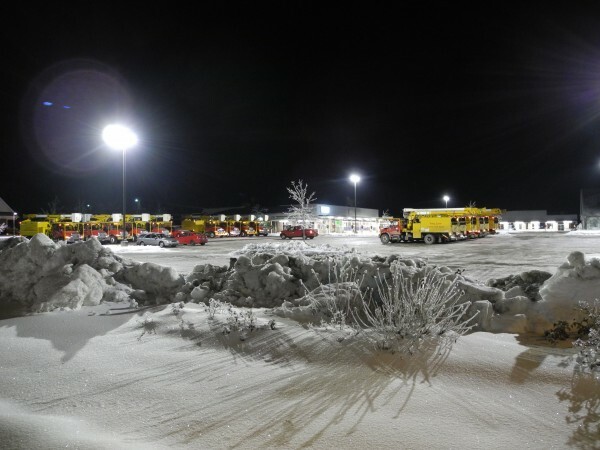 More than 450 line crews from all over the Eastern seaboard, from Florida to New Brunswick, came to Maine to help restore power lines damaged in the long ice storm. BELFAST, Maine — Elmer Cruz of Waterbury, Conn., didn’t expect to spend his Christmas holiday far from his family, working long shifts helping restore the power for Mainers left in the dark after the ice storm. But the employee of Lewis Tree Service Inc. still was smiling on Thursday, despite the fact that he was far away from his 5-year-old son. Cruz, who spoke with the BDN while gassing up his company’s bucket truck at a Searsport gas station Thursday, was one of hundreds of tree crew workers who came from up and down the East Coast to help fix damaged power lines. At least 350 line crews came to Maine from other New England states, New York, New Jersey, Pennsylvania, Florida and New Brunswick to aid Central Maine Power in what spokesman John Carroll described Thursday as “an enormous effort” to restore power to the utility’s 123,000 customers initially left in the dark. A workforce of 1,800 people worked for the utility on Christmas Day. By early Thursday afternoon, the number of Mainers without power been reduced to less than 23,000, mostly concentrated in Kennebec and Waldo counties. “That’s 123,000 hard-fought restorations,” Carroll said. The heavy ice continuing to weigh down branches, the cold weather Wednesday and Thursday’s snowfall all have conspired to make conditions hard for the line workers as they toil to restore the electricity. 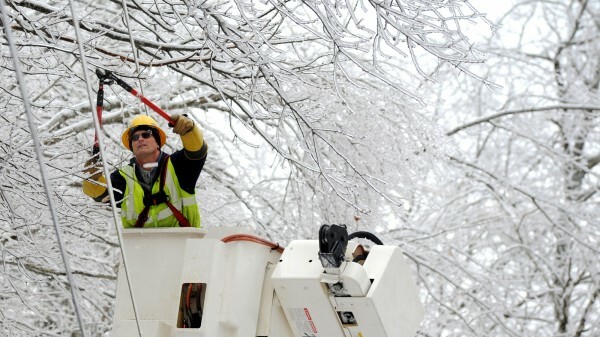 Restoring power after an ice storm is different, and more challenging, than working after a hurricane or snowstorm, Carroll said. In addition to the line crews from away, CMP also has about 90 of its own regular line crews and about 450 two-man tree crews at work in the state. Initially, an assessment team drives the power lines to find the damage. Then the tree crews go to work clearing the heavy limbs and trees away from the wires, followed by line workers who repair the utility’s equipment. Most crew members work 17 hours and then have seven hours off, Carroll said, with a smaller assortment of tree crew workers at it overnight to try to stay ahead of the line workers. The company also is in the midst of a massive, round-the-clock effort to keep the organization flowing smoothly. CMP needs to feed and house emergency workers so they don’t waste any of their seven hours off looking for shelter. The utility had a big challenge in finding food for all the workers on Christmas Day, when most restaurants are closed. “We have 750 line workers and tree crews. They had to eat,” he said. So CMP officials got to work, contacting Roger Bintliff, innkeeper at the Senator Inn & Spa in Augusta. At first he told them that the restaurant was closed and he had sent his staff home to enjoy the holiday with their families. Still, the scale of the operation was daunting, especially on a holiday. There wasn’t enough food in the facility. So CMP officials made a special call to the owner of Ballard Meats & Seafood in Manchester to get supplies, and the company came through. The power utility’s employees helped serve, bus tables and wash dishes, and the cold line crews were warm and well-fed. Workers in other places also were challenged to find food on Christmas Day and beyond. In Bucksport, the owner of MacLeod’s Restaurant opened just for all the line workers. The Red Barn in Augusta also has been feeding linemen for free while they’re working to restore power, and in Belfast, local volunteers will make breakfast Friday morning for line workers beginning at 4 a.m. at Belfast Area High School. Not all the workers were well fed on the Christmas holiday. Cruz and his fellow crew members ate cans of soup they heated on their dashboards. Andrew Johnson of Torrington, Conn., also with Lewis Tree Service Inc., said that it hasn’t been so bad. By Thursday, workers had generally helped restore power to the more populated affected areas of the state and were working in more remote regions. In some places, the power lines do not run next to the road and crews must access them using snowshoes or snowmobiles. On Islesboro, where all 922 CMP customers still had no power, the utility sent two ferry loads of bucket trucks on Thursday. Carroll said he hoped there would be fewer than 10,000 customers still without power by Thursday night. “We’re getting there,” he said.